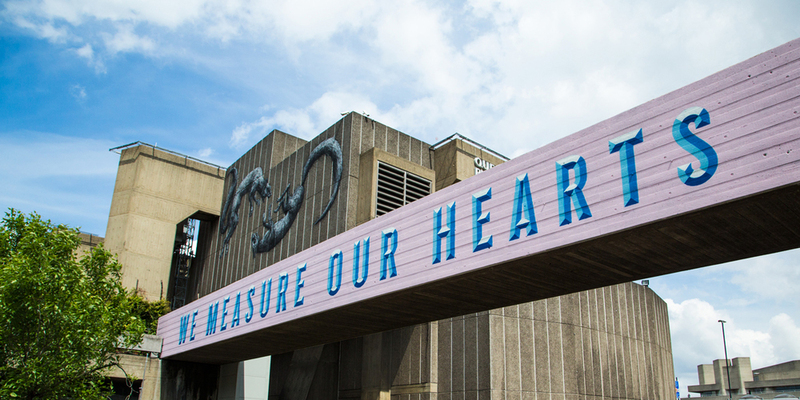 We were approached by London’s Southbank Centre to design and paint two murals on either side of the 35m walk walk heading to the Hayward Gallery as part of the Festival of Neighbourhoods. The festival paired up a variety of different poets with artists to create visual representations of poems relating to each of London’s 33 boroughs. Working with Cheryl Moskowitz and her poem about Wandsworth, we set out to research typefaces and signage found across the borough. Once we had collected all of our visual research we started to design a type based mural that fitted the sentiments of the poem and rang true to the found typography in the local area. Once the designs were signed off we began the installation which required the bread team hand-painting the design hanging from cherry pickers 22m in the air for 4 very long days. It was a great honour to be asked to paint on one of London’s most iconic buildings and the finished murals can be seen by commuters traveling across Waterloo bridge and tourists walking along the south bank with the bright friendly colours acting as a stark contrast to the concrete brutalist architecture. Other artists in the project included ROA and Phlegm. The project was featured on It’s Nice That and the Guardian. "The mural looks amazing – a job well done! It contrasts ROA’s and Phlegm’s monochrome designs so well.